What are the common challenges with front-end logging? Building applications in a distributed stack environment is common for enterprises today, but managing enormous volume of logs across distributed applications over multiple servers is definitely not easy. Front-end logging is a prerequisite to troubleshoot run-time failures, but it becomes even more challenging to detect specific errors and performance issues in a microservices architecture. Understanding the user behavior patterns is crucial to monitor application performance, and developers need sophisticated data visualization to extract actionable insights from the data. 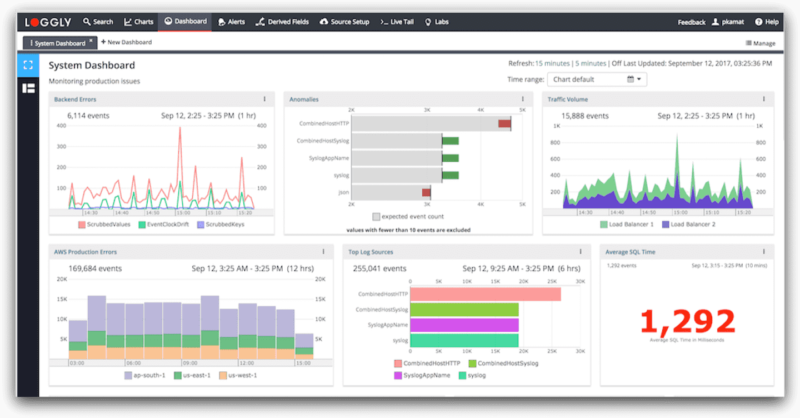 SolarWinds® Loggly®, a cloud-based log management solution, helps you unify and centrally manage all your front-end logs spread across distributed applications over multiple servers. Also, it is simple to send your front-end log data to Loggly in an agentless environment. In the case of microservices applications, it’s crucial to keep track of events across the distributed systems, which is possible only through centralized front-end logging to maintain searchable and filtered logs. Unified front-end error logging gives you a holistic view of the system to monitor your applications consistently. Loggly helps track down the root cause of application issues in the context of your distributed stack. Structured front-end error logging gives actionable insights into your application’s performance and usability. Using Loggly’s powerful features, like Dynamic Field Explorer, can help you pinpoint problem areas by spotting unusual event counts or outliers with just a few clicks. The Loggly Surround Search functionality helps you better understand the user experience by viewing all the surrounding events for any critical event across the entire distributed stack. Loggly also enables real-time monitoring of front-end logs across your distributed applications through its live tail feature. Loggly provides advanced data visualization and useful dashboards to help you retrieve valuable insights from the front-end log data. Interactive dashboards and charts help you monitor application behavior, health, and trends over a specific time range. Loggly also supports anomaly detection in your front-end logs so you can discover unexpected or suspicious events before they convert into severe problems. Loggly also allows to set up smart alerts, to ensure you are informed right away in case something is impacting your application performance.